Driving has quickly become one of the most common and most frequently used forms of transportation. Currently 74% of Canadians rely on a car as their primary source of transportation. The average person now spends 290 hours a year behind the wheel (Stats. Can., 2008 and AAA, 2016). That includes time spent driving for leisure, vacation and work. Driving required for work has been consistently rising. The average commute time has now reached 50 minutes a day with some individuals commuting up to 1 hour and 45 minutes. Additionally, the overall time spent driving at work can reach up to 13 hours a day for some occupations such as tractor trailer and taxi drivers (MTO, 2017). Consequently, ergonomics and driving is becoming an important topic. Sitting in a vehicle is different than sitting in a chair. Different postures and movements are required for driving, in addition to being exposed to vibration (CCOHS, 2009). The longer an individual works in an environment that requires occupational driving, the more likely they are to develop a musculoskeletal disorder (Greiner, B. & Krause, N., 2006). It has also been reported that individuals who drive at least half of their working hours each day endure three times the amount of musculoskeletal disorders than other workers (Greiner, B. & Krause, N., 2006). What are the risk factors associated with frequent driving? Psycho-social factors; such as stress. Upper and lower extremity pain. Cramps, pressure points and poor circulation in the buttocks and legs. Increased chance of low back injury when lifting heavy materials immediately after driving. Anyone who drives for long periods of time on a regular basis is at risk. This may include truck and bus drivers, heavy equipment operators, taxi and limousine drivers, first responders, delivery drivers and/or traveling sales representatives. What can I do to prevent musculoskeletal disorders from driving and improve comfort? One of the primary methods to prevent musculoskeletal disorders from driving and improve comfort is to ensure your vehicle is set up properly and exercise personal health practices (CCOHS, 2009). Seat height: raise the seat as high as you can however; ensure that you are still comfortable (sufficient room between the roof and the top of your head). After adjusting the height you should be able to see at least 8 cm over the top of the steering wheel. Cushion length of Seat (if possible): adjust the length so that the back of your knees are about 3cm-6 cm from the front of the seat. Seat distance from pedals: move the seat close enough to the steering wheel so you can easily push the pedals through their full range of motion with your whole foot. You might have to readjust the seat height in order to gain better control of the pedals. Cushion angle: tilt the seat cushion until your thighs are supported along the full length of the cushion. Back rest and Lumbar support: adjust the backrest until it supports your entire back while you are sitting upright. Once the backrest has been set, adjust the lumbar support. Adjust the support in-and-out and up-and-down until you feel an even pressure along your back from your hips to your shoulders. If the car is not equipped with adjustable lumbar support a rolled sweater or towel can be used to provide additional support for the low back. Steering wheel: adjust the height, tilt and reach of the steering wheel until you are in a comfortable position. The center of the steering wheel should be approximately 25cm-30cm from the driver’s chest. Driving is a daily occurrence for many individuals whether it is for leisure, travel, commuting and/or work. Health risks are possible for anyone who frequently drives, particularly individuals who are required to drive for work. Reduce prolonged sitting and driving time. Take breaks, stretch and rotate drivers when possible. Ensure the vehicle is properly set up. Avoid handling heavy materials immediately after driving. If you require prescription eyewear, always wear your prescription eyewear and ensure it is clean when you are driving. Keep your headlights, tail lights and the windshield clean both inside and outside. Address your personal health concerns and attend regular appointments with your health care providers. 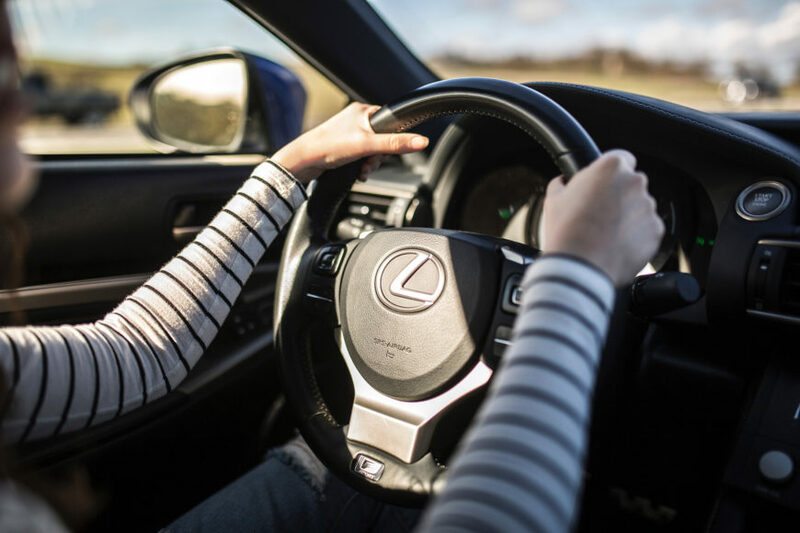 Practice proper postures when driving; avoid slouching, keep your hands at 9 and 3 on the steering wheel and keep your head seven centimeters or less from the head rest. Slightly adjust the backrest if you’re driving for long periods of time. This will help redistribute the weight amongst your back. Text Neck, Blackberry Thumb, Digital Eyestrain and Cellphone Elbow… Is Your Cell Phone Harming You?